Under the guidance of Downbelow’s resident PADI Course Director Richard, our professional interns got some valuable environmental experience this week. We spotted another illegal net snared on reefs in the Tunku Abdul Rahman Park, which is marine preserve and the reason net fishing is banned. Good thing that our awesome interns are conservation minded, as the tricky task of removing marine debris requires care and commitment. After Richard thorough briefed them, the well-organised team of dive professionals set to work steadily and carefully cutting free the net, before raising it to the surface for safe disposal. The entangled net is a blessing in disguise. On the one hand it’s a terrible environmental menace, because apart from its obvious purpose of entangling marine life, which – discarded at the ocean bottom – it does needlessly, it also gradually chokes and damages the coral reef. On the other hand, the unfortunate situation will not be for naught. It’s a relatively rare opportunity for our interns to gain valuable net removal experience, which is a delicate operation that requires careful planning and a cautious approach to be effective. 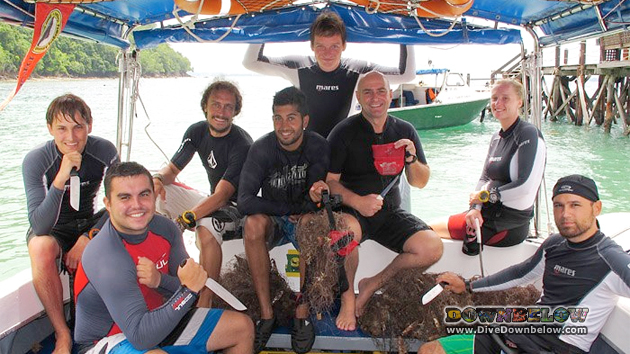 It will no doubt benefit our professional interns running their own Project AWARE events in future as diving professionals, because nets easily get entangled on corals and it happens everywhere where fishermen use nets near coral reefs. If, as a diver in the TAR Park, you ever spot a discarded net, please do let us know and, for the love of our oceans, we’ll arrange for it to be removed. See more net removal pictures in our album on Facebook.